Skoda revealed the Kodiaq Scout last year as the rugged version of the Kodiaq SUV. It gets increased ground clearance and added body protection in form of cladding and underbody layers to keep it safe during off-roading. Even though the pick-up trucks are not quite popular in the Indian market, the pick-up truck based on Kodiaq is something that will grab all the attention on the roads. The Skoda Kodiaq is a seven-seater SUV. The one in the rendering is a four-seater. It gets all the four gates for easy access to the seats and the wheelbase has been increased to accommodate the pick-up flatbed in the rear. It gets a small pick-up bed but it can be quite useful while transporting heavy duty things like off-roading equipment or even household equipment like big flower pots. Not much has been changed on the design-front in the Skoda Scout pick-up truck. Skoda did the job of making it rugged, the rendered image added the rear flatbed to make it look like a perfect weekend car. It gets dual-tone paint job with silver inserts around the flatbed. The unique combination makes the Skoda Kodiaq Scout look very classy. The Kodiaq gets thick plastic cladding around the body that ensures that it remains saved from the scratches and dents. The Kodiaq also offers a 4WD system that allows it to go to a few challenging places too. 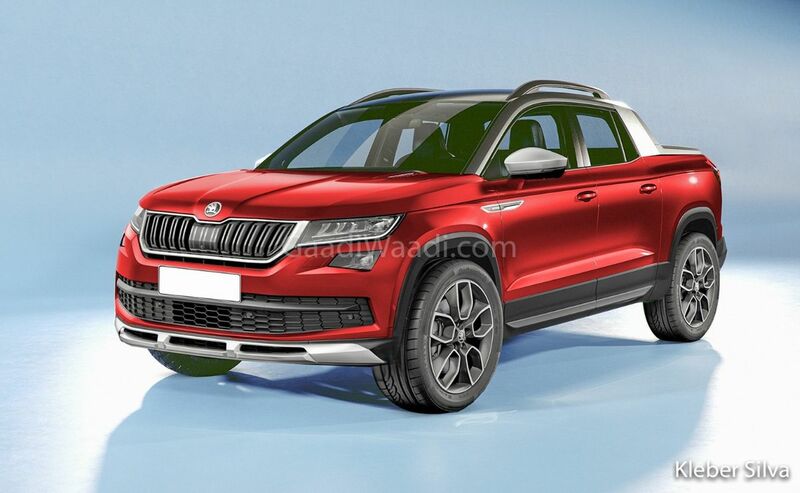 Skoda does not offer any pick-up truck in their line-up as of now but we may get to see one in the future if the demand grows. The Skoda Kodiaq is the flagship SUV of the brand and comes with clever features. The Skoda Kodiaq gets features like removable cabin lights that can act as a torch, It gets adaptive cruise control system, adaptive headlamps, and handsfree parking assist. The Kodiaq is a premium car and gets features like whisper talk, a feature that picks up the voice in the microphone and plays it through the rear speakers, which allows people to talk in their normal voice to the people sitting in the rear.